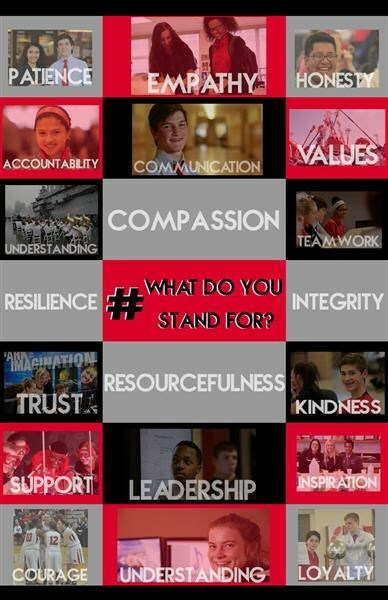 HomeAcademicsGuidance DepartmentWhat Do You Stand For? In October 2016, Marist High School’s Guidance Department introduced a multifaceted program meant to challenge and inspire students. #WhatDoYouStandFor is seen in print and web materials around the school, and is integrated into many aspects of school life. The phrase represents a school wide effort to promote integrity, resourcefulness, compassion, and resilience, as students reflect and act on the values they stand for in life. The program is holistic in its approach to student life, with not only the Guidance Department, but campus ministry, student activities, athletics, and academic departments participating in events and programming throughout the year. As with all efforts at Marist, it will take place within the scope of our Catholic faith. "The development of this program originated from a discussion within the guidance department. We arrived at the idea that teens should not only be taught things that they should not do. We wanted to develop a program to inspire our students to continually examine their values and model those values in everyday life," explained Marist social worker Cathaleen Novak. "The question, 'What Do You Stand For? ', will guide programming throughout the year and into the future. The program involves a collaboration among all facets of the Marist High School community." The program include events, speakers and awareness programming. For the 2017-2018 school year part of the efforts include a parent workshop series. The first, focused on raising resourceful teens, was held on October 5. Future events are scheduled for December 12, February 6, and April 17.